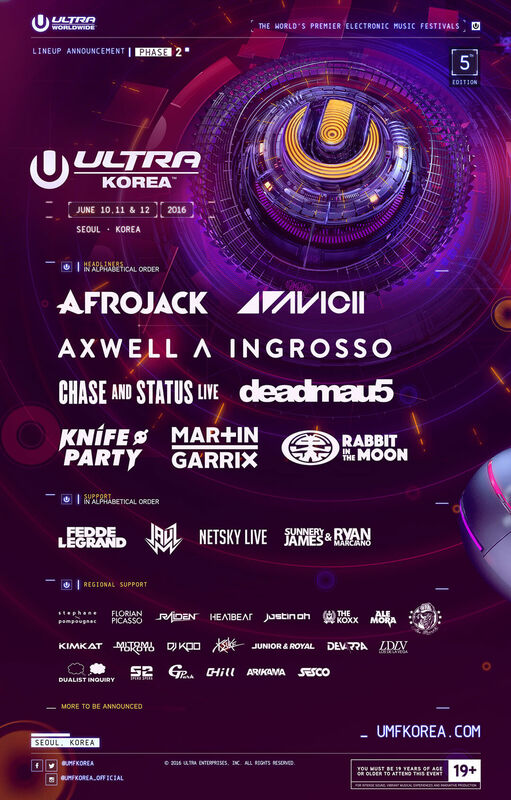 With less than two months until ULTRA Korea opens the gates for its landmark fifth edition, the largest electronic music festival in Korea’s history now announces its incredible Phase Two lineup. Set to run for three days this June 10 – 12 in Seoul, ULTRA Korea has pulled out all the stops for Phase Two, with the likes of Chase and Status (Live), deadmau5, Knife Party and Rabbit in the Moon (Live) now added to an already staggering list of Phase One headliners, that includes Afrojack, Avicii, Axwell^Ingrosso and Martin Garrix. All of these global superstars will be bringing their one-of-a-kind performances to Korea, with an incredible five headliners making debuts at the festival. To add to the headliners, international support for Phase Two comes from Fedde Le Grand, Jauz, Netsky (Live) and Sunnery James & Ryan Marciano, with regional support from some of Asia’s most exciting up and coming talent such as Justin Oh, Ksuke and Raiden. Fresh off playing THREE times at ULTRA Music Festival in March, deadmau5 will grace the ULTRA Korea Main Stage for the first time, as he prepares to bring his unrivalled brand of electronic music to Korean Ultranauts. Joining him will be Knife Party, who return for the second year in a row having rocked Seoul back in 2015. Additionally, Chase and Status, two icons of the drum and bass scene, are set to perform their cherished hits on the LIVE Stage, whilst legendary outfit, Rabbit in the Moon, who performed at the very first Ultra Music Festival back in 1999, are guaranteed to put on a true showcase during what will be their debut performance in the country. Lauded by MTV Asia as the ‘go-to EDM Festival in Asia’, over one hundred thousand people are expected to attend ULTRA Korea across the three days this June. With both Early Bird and Advance Sale tickets having already sold out, fans will have to move fast in order to snap up the General Admission three day combo Tier 1 tickets that are now available, priced at 220,000 KRW for residents in Korea and 220 USD for those based overseas. Visit umfkorea.com/tickets to get yours. With a Phase Three set to be announced very soon, and with set times and more still to be revealed, the fifth edition of ULTRA Korea is shaping up to be its biggest yet. ULTRA Korea takes place on June 10, 11 and 12, 2016 and is a 19+ event. For further details and ticket information, head to umfkorea.com.